Then I saw the small hole in the middle of the pendant, and knew that this fixture wouldn't work because the big metal 'neck' wouldn't fit through the teeny hole. Or just turn off the light switch, if you like to live on the edge. No really, don't do that. They initially didn't want to budge, however they were no match for a pliers and my bodacious biceps! It was off in a flash and I could see more fleshy peach/yellow paint. What is it with this color in old houses?? I can't believe it ever looked good. And BOOYA! Old fixture waves goodbye with sad electrical tenticles. How cringe-worthy. I happened to have this laying around the house, and I thought it would look nice as a bigger fixture 'base' to equal the diameter of the capiz pendant. Up it went with some painters tape while I attached the new fixture. Some people use adhesive on medallions, but the fixture itself will hold it on, so I don't bother with it. Here is my new fixture, a 4 inch globe base. I planned to use the three small holes that are meant for attaching the globe to hang the pendant with wire. And paint out the black. Here is where you would usually screw in the new fixture cross bar, however my old cloth-wrapped wiring wouldn't stretch far enough to come down the few inches needed to attach in this manner, so I connected the wiring first and then stuffed it up into the ceiling. Eh, you work with what you got. I just twisted the wires together and used some new wire nuts to connect them fully. The cross bar/mounting strap gets screwed on to the light box. Wrap your grounding wire around a screw. Follow the directions on your fixture for how it gets attached to the mounting strap. This one had a twist and lock mechanism. After tightening up the screws a tad, I jumped off the ladder to survey whether the medallion was straight before tightening fully. The next step was to get some picture wire to attach the capiz pendant to the fixture. Shaun held up the pendant while I wrapped the wire. Did I do a beautiful job? Heck, no. But no one will notice the wire, and it is a strong hold. And my arms hurt. After a successful attachment, I spent the next 15 minutes unwrapping all the shells. All the work was worth it in the end, I'm in LOVE with this light! I hope this post has inspired you to tackle the ugly lights in your life! And thank you all so much for your wonderful comments about my new favorite room of the house! Awesome! I'm about to embark on my own light-changing journey this weekend. I'm hoping to also do the job solo. Thanks for the inspiration! Wow, that room looks great! And I was afraid to change light fixtures before, but I think you've inspired me. Very helpful and useful information. Thank you. Bragging Rights EARNED! Good job not getting electrocuted. It is an awesome new light fixture. I usually don't say this, but I can't help it.... You go girl! Nice job on the fixture switcheroo. Electrical wiring is kind of intimidating. And very nice pictures of the glowing light! Looks fab! Also, I completely understand about the paint. Every time we switch out a light fixture or switch plate we discovery some hideous color. My entire house was hunter green, school bus yellow or brilliant electric blue at some point. AMAZING girl! That gray paint and the light really make all the difference in the world. I would totally want to shop in your room! LOL. Oh, and the drapes of course are phenomenal... Yay! but what did you mean by "then I stuffed some kleenex in the receptacle" .... I don't think I've ever seen that in any electrical directions before! Sharon, I just meant that I stuffed the area where the bulb will go with kleenex so no spray paint would get inside! I should've clarified that, the kleenex didn't stay in there. Too funny! This is AWESOME! Thanks for the step-by-step process. It doesn't look as scary as I thought! Great job! I have a walk in closet that I luckily DO NOT have to share with my hubby and I just decided that I'm going to replace the gross boring light that's in there with this same beautiful light!! woo hoo!! Girl power! Great job and who knows, you may have just inspired me to try this instead of asking my husband to do it. We had the same problem in my craft room with the old fixture with a giant ugly hole and used a ceiling medallion. They are so much easier than patching and painting and I love the way they look. I mentioned it before....but I love the light fixture! LOVE it! And thank you for the shout out :D...I actually like your light SO much more than mine, the ceiling mount looks sooo much better than how I have mine hanging as a chandelier...I think I may need to copy your procedure!!!! It looks stunning!!! Question: So you did not use the World Market cord kit to install this light? I am now in possession of this exact pendant, but I'm not sure if I need the cord kit. Thanks yo! Micah, I didn't use the cord kit. I think that is more for a floor lamp, or if you want to plug it in and swag it to the ceiling. Go to the hardware store and buy a simple 'globe base' fixture, the little holes that are supposed to hold on the globe are perfect for wiring up your pendant. Just make sure whatever you buy has a receptacle that will fit through that little hole in the pendant! How have I not found your blog before now? 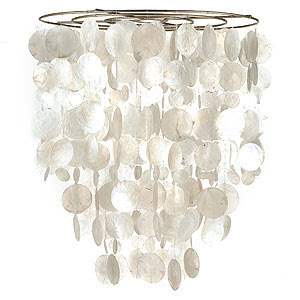 I just got this exact light fixture from World Market and had the same problem with it not fitting over my old fixture. Your hack worked like a charm! Thanks! love the fixture...will you please share where you found the rug and if it came in other colors?? thanks much! love the fixture...will you please share where you found the rug and if it came in other colors?? thanks! The rug is Pottery Barn Moorish Tile, they discontinued it over a year ago, unfortunately! I have it in yellow and orange, they also made it in brown.